Enthusiasm for the use of dietary bioactive compounds as chemopreventive agents and adjuvants for current therapies has increased laboratory research conducted on several types of cancers including Head and Neck Squamous Cell Carcinoma (HNSCC). The green chemoprevention movement is a modern approach to highlight healthy lifestyle changes that aim to decrease the incidence of HNSCC. A healthy diet can be an effective way to prevent the development of oral cancers. Discovery of the naturally occurring plant based compounds called phytochemicals has facilitated the development of new treatment strategies for patients that are at risk for, or have developed HNSCC. Many of these compounds have been shown to elicit very potent anti-carcinogenic properties. While there are many compounds that have been studied, the compounds from two specific categories of phytochemicals, phenolics (resveratrol, EGCG, curcumin, quercetin, and honokiol) and glucosinolates (sulforaphane, PEITC and BITC), are emerging as potent and effective inhibitors of oral carcinogenesis. 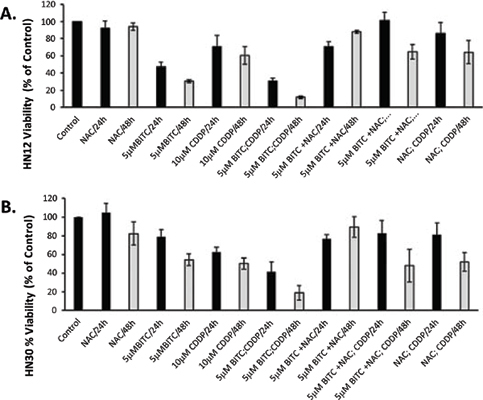 These compounds have been shown to inhibit HNSCC growth through a variety of mechanisms. Research has demonstrated that these compounds can regulate cancer cell proliferation through the regulation of multiple cell signaling pathways. They can impede cell cycle progression, induce differentiation and apoptosis, prevent angiogenesis, and inhibit cancer cell invasive and metastatic properties. They can protect normal cells during treatment and reduce the damage caused by chemotherapy and radiotherapy. This review aims to provide an overview of some of the most effective phytochemicals that have the potential to successfully prevent and treat head and neck squamous cell carcinoma. Keywords: Head and Neck Squamous Cell Carcinoma, Phytochemicals, Resveratrol, EGCG, Curcumin, Quercetin, Sulforaphane, BITC. Keywords:Head and Neck Squamous Cell Carcinoma, Phytochemicals, Resveratrol, EGCG, Curcumin, Quercetin, Sulforaphane, BITC. Abstract:Enthusiasm for the use of dietary bioactive compounds as chemopreventive agents and adjuvants for current therapies has increased laboratory research conducted on several types of cancers including Head and Neck Squamous Cell Carcinoma (HNSCC). The green chemoprevention movement is a modern approach to highlight healthy lifestyle changes that aim to decrease the incidence of HNSCC. A healthy diet can be an effective way to prevent the development of oral cancers. Discovery of the naturally occurring plant based compounds called phytochemicals has facilitated the development of new treatment strategies for patients that are at risk for, or have developed HNSCC. Many of these compounds have been shown to elicit very potent anti-carcinogenic properties. While there are many compounds that have been studied, the compounds from two specific categories of phytochemicals, phenolics (resveratrol, EGCG, curcumin, quercetin, and honokiol) and glucosinolates (sulforaphane, PEITC and BITC), are emerging as potent and effective inhibitors of oral carcinogenesis. These compounds have been shown to inhibit HNSCC growth through a variety of mechanisms. Research has demonstrated that these compounds can regulate cancer cell proliferation through the regulation of multiple cell signaling pathways. They can impede cell cycle progression, induce differentiation and apoptosis, prevent angiogenesis, and inhibit cancer cell invasive and metastatic properties. They can protect normal cells during treatment and reduce the damage caused by chemotherapy and radiotherapy. This review aims to provide an overview of some of the most effective phytochemicals that have the potential to successfully prevent and treat head and neck squamous cell carcinoma. Translational Research: A Future Strategy for Managing Squamous Cell Carcinoma of the Head and Neck?